Gemán Doin, the director of the documentary The Forbidden Education, is keeping him up-dated on what projects to visit and what persons to contact. And that´s how Bruno found me and Explora. Since I don´t have that much time, I told him he could assist one of my sessions with my facilitator team and he gladly accepted. The cool thing was that it was just the day I was going to explain what exactly an ALC is, and on what foundations it´s built. Is it enough to say we had an incredible time all of us? Is it enough to say that Bruno himself experienced a quantum leap in his own thinking? Is it enough to say that he´s super impressed with the ALC concept, the ideas behind Explora and that he sees me as this rad visionary, unique in Latin America? No, it´s not enough, because then I was interviewed and filmed and will now be part of his documentary!!! This is a big time woooohoooo for me. 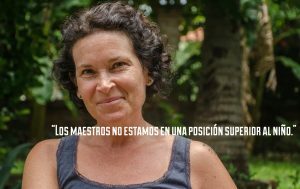 I´ve been working on positioning myself as an expert on alternative education in Latin America, but it takes time and I´m still very isolated geographically. But here someone shows up, eager to talk with me about what I think, listening to every word I say like as if they were precious drops of gold. Again I feel so seen as a person, and appreciated for all that I do. Now Bruno is all about how to get my book translated from Swedish to Spanish. – We need this book in Latin America, he says. My life is expanding in the most incredible ways lately, and all I can think is: how could it get any better that this?